Labour party leader revealed to have defended schools' decision to send children to festival featuring woman who vandalized Warsaw Ghetto. British Labour leader Jeremy Corbyn has come under fire again for defending the decision of schools to send students to a festival which featured a campaigner who vandalized the Warsaw Ghetto. According to investigative journalist Iggy Ostanin. Corbyn slammed the British Board of Deputies for considering banning eight schools from attending the Tottenham Palestine Literary Festival in 2011, accusing the board of having "a record of denunciation of all things Palestinian." One of the speakers at the event was Ewa Jasciewicz, who spray-painted "Free Gaza and Palestine" on the wall of the Warsaw Ghetto in 2011. "The Board of Deputies are hardly objective in this matter. Their record of denunciation of all things Palestinian is well known," Corbyn told the Islington Tribune at the time. "It’s a great opportunity for children to understand the wealth and joy of Palestinian literature and a little of the history of the region," Corbyn said, adding that he planned to attend the festival himself. Then-Education Secretary Michael Gove made the final decision to ban the schools from sending their students to the festival on the basis that doing so would violate the Education Act. In 2009 Corbyn called Jasciewicz his "good friend." The British Labour party has been mired in accusations of anti-Semitism since Corbyn was elected as party leader in 2015. Dozens of Labour members have been suspended over their anti-Semitic statements, and the party has been criticized for its failure to deal with the phenomenon. 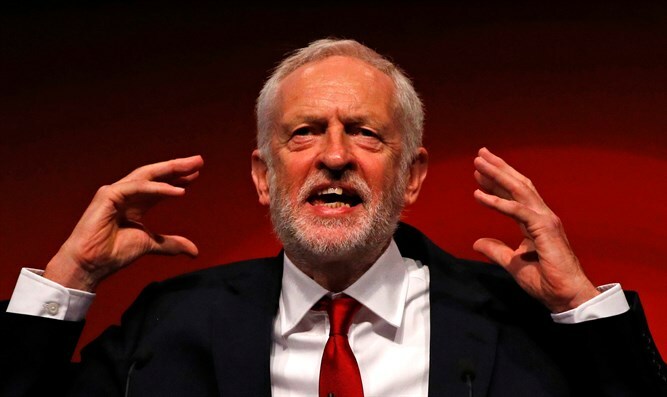 Corbyn has come under fire as well for calling Hamas and Hezbollah his “friends” and continues to be plagued by incidents of anti-Semitism and anti-Israel statements. Last year, the Daily Mail newspaper published photos of the Labour leader at a cemetery in Tunisia holding a wreath near the graves of some of the Palestine Liberation Organization (PLO) terrorists who were responsible for the massacre of the 11 Israeli athletes at the 1972 Munich Olympics. In addition to all of these, Corbyn has been criticized for playing down the anti-Semitism in his party and for alienating Jews.